Arsenal Authentic evoKNIT Home Shirt 2018-19 It’s a fresh start for the Gunners in the 2018-19 season, as represented by the revamped design of the classic colours in the Arsenal Authentic evoKNIT 2018-19 Home Shirt. A diamond-cut pulse design runs across the chilli red heather chest, r..
For the ultimate Südtribüne experience, join the Dortmund team in the BVB Authentic evoKNIT 2018-19 Home Shirt. Matching the fit and function of the shirts worn on pitch at Signal Iduna Park, the shirt has a sleek look that enhances the clean and simple style of the 18-19 kit. &.. The new evoPOWER Vigor 1 for firm ground optimizes the interaction between kicking velocity and accuracy. The elastane sock combined with the one-way stretchable AdapLite upper material and the G.S.F. outsole technology allows the foot to bend as in a barefoot kicking motion, thus enabling an optimu..
evoSPEED Fresh 2.0 FG Men's Football Boots: The second generation of the evoSPEED Fresh football boot continues the evolution of temperature regulation to improve your comfort and your game. This shoe features engineered mesh to keep the temperature within the boot down, and only a minimalistic..
Live the passion. 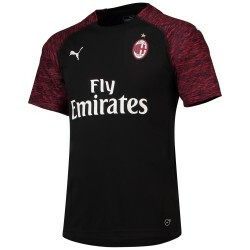 Live AC Milan with the official PUMA licensed 2018-19 replica home shirt. As classic as it can get, the Rossoneri's new home kit comes with the traditional red and black stripes, a classic polo collar and a small devil detail at the back of the neck. FEATURES + BENEFITS dr.. The new Austria Home Shirt 2016 – Red celebrates the first Austrian national side to progress through the qualifying round to a European Championship tournament finals. This official Austria home shirt for 2016 combines a diagonal blood red gradient graphic with striking white shoulders and elimi..
PUMA supports the right of football fans everywhere to love their teams with unabashed devotion. After all, PUMA is one of football’s longest-running fans and proudest supporters. We’re especially proud to offer officially licensed football kits. Austria fans – show your love in Austria’s awesome Ho.. Simplicity is key for Borussia Dortmund’s 2018-19 kit, as the team look to fully complete the yellow wall with a clean, minimal design on the BVB Home Shirt. The plain body is offset by black sleeves and shoulders with a yellow stripe around the middle, delivering a modern style to the Signa..
PUMA believes that it’s okay to be obsessed with football. We’ve been obsessed with it since 1948. Our officially licensed fan wear is a shout-out to football fans like us. We understand your devotion. Pojďme hoši, pojďme do toho. Vítězství! FEATURES + BENEFITS dryCELL designation for moisture..
Kawasaki Frontale 2018 Home Shirt - Authentic Version Please refer below size chart: .. WORN IN THE ROAR OF KING POWER STADIUM. Leicester City players wear this soccer jersey for home games. The design stays true to the club's roots with a classic blue. Lightweight, sweat-wicking fabric keeps it equipped for the modern game. Regular fit is wider at the body, with a straight si.. PRODUCT STORY Live the passion. Live Newcastle United with the official PUMA licensed 2018-19 replica away shirt. FEATURES + BENEFITS dryCELL: Highly functional materials draw sweat away from your skin and help keep you dry and comfortable during exercise DETAILS Official NUFC crest applied o.. Worn by the outstanding pro himself, this special edition Derby Fever cleat proves its speed, performance, and spirit on the field. The evoSPEED SL-S is the latest cleat in the SPEED family, sharing the same philosophy of enhanced speed and agility. Constructed with a Japanese microfiber upper mat.. The all-new evoSPEED 17 SL-S is designed for high performance players looking for a close touch to ball feel and ultra lightweight boot. It's SPEEDFRAME ensures support for every quick turn, as its Grip-tex application allows for grip on the ball. Its upper, made of high-quality synthetic leather,.. The all-new evoSPEED 17 SL-S is designed for high performance players looking for a close touch to ball feel and ultra-lightweight boot. Its SPEEDFRAME ensures support for every quick turn, as its Grip-tex application allows for grip on the ball. Its upper, made of high-quality synthetic leather, .. Introducing the new Arsenal Adult 2017/18 Short Sleeved Home Shirt. Offering the perfect balance between heritage and present day design the new 2017/18 home shirt retains the modern style in a deeper more historic red. This season's home shirt includes the highly functional Puma dryCELL technol.. The new Austria Away Shirt 2016 – White celebrates the first Austrian national side to progress through the qualifying round to a European Championship tournament finals. This official Austria away shirt for 2016 employs striking black accents to counter its white base and eliminates the ÖFB cres.. Simplicity is key for Borussia Dortmund’s 2018-19 kit, as the team look to fully complete the yellow wall with a clean, minimal design on theBVB Long Sleeve Home Shirt. The plain body is offset by black sleeves and shoulders with a yellow stripe around the upper arm, delivering a modern style to t.. Represent your favourite national team with the officially licensed Czech Republic Away Replica Shirt. This pure white jersey is the pinnacle of elegance, simplicity and style. FEATURES + BENEFITS dryCELL: Highly functional materials draw sweat away from your skin and help keep you dry and com..
With a modernised crest accompanying a signature Italian design, the Italy Home Shirt 2018 stands alone in being the first in traditional Azzurri colours to be worn by the legendary Gianluigi Buffon. While his Italian teammates have worn the nation’s famous blue jersey for man.. The new super lightweight evoSPEED 17 SL-S is a high-performance football boot for firm ground. The soft and durable Japanese synthetic upper material provides comfort and a close touch to the ball. The required support for quick turns is secured by the minimalistic SPEEDFRAME structure, while the G.. Introducing the new Arsenal 2017/18 Short Sleeved Home Goalkeeper Shirt. Following on from the popularity of last season's short sleeved goalkeeper shirt this season's shirt benefits from the highly functional dryCELL technology. The material is designed to draw moisture away from the skin.. The club's history and identity are embodied within each garment of the official PUMA Licensed Football Apparel, proudly worn by players and fans on and off the pitch. Built with highly functional materials, this Newcastle United Third Shirt helps to draw sweat away fr..
As the club enter a new era, the Arsenal 2018-19 Kid’s Home Shirtrevamps the on pitch look with a fresh design that extends the classic white sleeves across the shoulders to contrast with a chilli red heather base. A diamond-cut pulse design runs across the chest, representing the beat of the c.. PRODUCT STORY Live the passion. 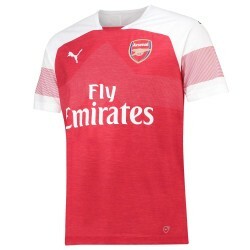 Live Arsenal Football Club with the official PUMA licensed 2018-19 goalkeeper shirt, sporting exclusive colours and graphics. FEATURES + BENEFITS dryCELL: Highly functional materials draw sweat away from your skin and help keep you dry and comfortable ..
Show off your Italian pride with the Italy 2018 Away Shirt. Mirroring the style of the home kit, the Away shirt is presented in all-white with blue detailing on the collar and cuffs. The sleeves have a layered look that incorporates the colours of Italy’s flag. The modernised crest..
Leicester City wears this away jersey while turning home pitch advantage into a myth. Its black-and-gold design takes style cues from streetwear. The sweat-wicking, lightweight construction keeps players dry, comfortable and focused on the next move. Regular fit is wider at the body, with a st.. 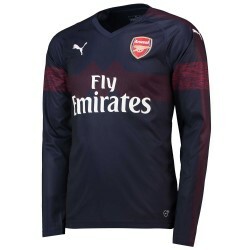 The Arsenal 2018-19 Long Sleeve Away Shirt presents a dark look for the Gunners to contrast with the home kit and usher in a new era for the club. A subtle red melange stripe runs across the deep navy shirt to give the club a sleek, modern look as they dominate the opposition. &nb.. The Arsenal 2018-19 Women’s Away Shirt presents a dark look for the Gunners to contrast with the home kit and usher in a new era for the club. A subtle red melange stripe runs across the deep navy shirt to give the club a sleek, modern look as they dominate the opposition. .. The Arsenal 2018-19 Kid’s Away Shirt presents a dark look for the Gunners to contrast with the home kit and usher in a new era for the club. A subtle red melange stripe runs across the deep navy shirt to give the club a sleek, modern look as they dominate the opposition. .. PRODUCT STORY Live the passion and show your support for the Rossoneri in the official 2018/19 season’s third shirt. Forza Milan! FEATURES + BENEFITS dryCELL: PUMA's designation for moisture-wicking properties that help keep you dry and comfortable DETAILS Regular fit with double knit bio-bas.. The Gunners have a fresh look this season with the Arsenal 2018-19 Third Shirt in light turquoise, inspired by the 1982-83 “Bluebottle” kit. The shirt uses Puma dryCELL fabric for sweat wicking comfort with a breathable feel. An A-symmetric cut prevents the shirt from riding u..
Arsenal Third Shirt 2018-19 - Long Sleeve The Gunners have a fresh look this season with the Arsenal 2018-19 Third Shirt in light turquoise, inspired by the 1982-83 “Bluebottle” kit. The shirt uses Puma dryCELL fabric for sweat wicking comfort with a breathable feel. An A-sym..
Figc Italia Goalkeeper Shirt Replica Ss Color: Puma Red Material: Season: 18/20 ..
Figc Italia Goalkeeper Shirt Replica Ss Color: Puma Green Material: Season: 18/20 ..
European Championship runners-up on two occasions since the turn of the century, the Azzurri will aim to go one better at Euro 2016; and fans can support them in trademark Italian style with the Italy Home Shirt 2016 – Blue. Inspired by the traditions of an Italian tailor, this official Italy hom..
Show pride for your favourite team with the Italy Away Shirt. New for 2015/16, this away shirt is inspired by the tradition of Italian craftsmanship, the design is full of flair and desirability, keeping PUMA's National Team Icon sharp and tight on pitch and proudly worn by the fans. ..